Gu Zhenqing graduated from the History Department of Fudan University, Shanghai, China. His experience includes curation for numerous museums in China and also as the chief editor for art magazine. 1987 Graduated from the History Department of Fudan University, Shanghai, China. 2003 Worked as the chief-curator of Shanghai Duolun Museum of Modern Art; the director of 2004 Chinese Contemporary Art Awards. 2005 Worked as the chiefcurator and deputy director of Shanghai Duolun Museum of Modern Art; Taught as the assistant professor of the Fine Art Department of Tunghai University, Taichung, Taiwan. 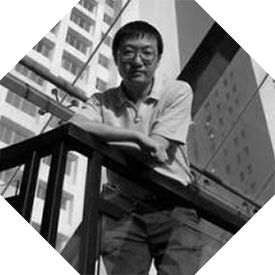 2006 Worked as the chief-curator and executive director of Zhu Qizhan Art Museum, Shanghai. 2007 Worked as the chief-curator of Zhu Qizhan Art Museum, chief-editor of art magazine Visual Production; member of Final Jury of 5th Taishin Arts Awards. 2008 Worked as chief–editor of art magazine Visual Production; member of Final Jury of 2008 Chinese Contemporary Art Awards, guest professor of Tianjin Academy of Fine Arts, Tianjin. 2009 Worked as artistic director of White Box Museum of Art, Beijing and guest professor of Xi’an Academy of Fine Arts, Xi’an. 2011 Worked as artistic director of Li-space Culture & Art Center, Beijing, China. Currently lives and works in Beijing as a curator. 2013 2013 Reunion Biennale, Magasin D2, Les Quais, Le Port, Reunion. 2013 “Timeline” Contemporary Art, Youmingtang Art Center, Nanning, Guangxi, China. 2011 2011 Reunion Biennale, 80 Warehouse Navy Pier, Le Port, Reunion. 2010 Live Fossil: Weng Fen Solo Show, Musee Leon-Dierx, Saint Denis, Reunion. 2010 Two Lines, BWA Museum, Zielona Gora, Poland. 2010 Likeness of the Otherness, Galeira Arsenal, Bialystok, Poland. 2009 From 5.8m, Beijing Li-Space Culture & Art Center, Beijing, China. 2009 Home Court, White Box Museum of Art, Beijing, China. 2009 Rave Forum, Beijing Li-Space Culture & Art Center, Beijing, China. 2008 1st Mediation International Art Biennale, Poznan, Poland. 2008 We Shall Overcome, Beijing Li-Space Culture & Art Center, Beijing, China. 2008 First Exhibition, Beijing Li-Space, Culture & Art Center, Beijing, China. 2007 A Chinese Dream: From the Sigg Collection, ARTSingapore, Exhibition Hall 404, Suntec City, Singapore. 2006 Double Kick Cracker, Tang Contemporary Art, Beijing, China. 2006 Fantasy and Future, Metropolitan Museum, Manila, Philippe. 2006 China Pavilion: Independent Biennial of 2006 Liverpool Biennial, Independent Quarter, Liverpool, U. K.
2006 China Coup by Red Mansion Art Foundation, Hospital Club, London, U. K..
2005 Focus on China – Tolerance & Identity, Gallery of Vrije Academie, Den Haag, Holland. 2005 City_net Asia 2005, Seoul Museum of Art, Seoul, Korea. 2005 To Each His Own, Zero Field Experimental Art Center, Beijing, China. 2005 Two Asias, Two Europes, Shanghai Duolun Museum of Modern Art, Shanghai, China. Galerie Münsterland, Emsdetten; DA, Kunsthaus Kloster Gravenhorst, Hörstel; Germany. 2005 Back to the Future II: Shanghai Arts, Kunsthalle Faust, Hannover, Germnay . 2005 Back to the Future I: Shanghai Arts, Inner Spaces, Poznan, Poland. 2005 Express: Hexa Project in Shanghai, Shanghai Duolun Museum of Modern Art, Shanghai, China. 2005 Four Ounces Deflects A Thousand Pounds, Arts Center of Tunghai University, Taichung, Taiwan. 2005 “Shanghai Cool: Creative Reproduction” international art exhibition, Shanghai Duolun Museum of Modern Art, Shanghai, China. 2005 Living in Interesting Times: A Decade of New Chinese Photography, The Israel Museum of Photography, Tel Hai, Israel.